This Code of Conduct serves as a guideline of the expected behaviour and attitude of children, parents and staff members at Teddy Bears Montessori. No person will be discriminated against based on their race, gender or creed. We are required to be careful with our equipment, as is costly to replace. Biting, hitting, spitting and screaming is NOT tolerated. If I am angry I need to call someone to help me sort out any problem. We are shown the appropriate manner on how to interrupt an adult or child while they are busy. We are required to say “please”, “thank you” and “excuse me”. I understand that swearing, bad language as well as name calling is inappropriate and unacceptable at our school. We are required to walk indoors at all times, as this is a safety precaution within our environment. We are NOT allowed to shout at our friends, we need to walk up to them or talk softly to them. We are not allowed to bring our toys to school as we might become upset if it gets damaged or misplaced. We are NOT allowed to “fiddle” with other people’s private parts, or use explicit sexual behaviour with our friends. We are expected to say sorry if we are wrong or if we have hurt someone or their feelings, even if by accident. It is kind to share and we strive to be kind individuals. When we eat we are expected to sit at the table until we have finished our meal. We never play with our food or put things into our mouths that have been lying on the floor or in the garden. We need to co-operate with each other at all times, especially on outings. We are not allowed to throw things or sand at each other. We are NOT allowed to sit or stand on tables. Chairs are for sitting on. We are NOT allowed to go out of the school grounds without an adult next to us. We need to keep our bodies clean so we always wash our hands after we have been to the toilet or have been playing outside. We like to be in a clean environment, so we help each other to pack away all the things we have been playing with. We always make our visitors feel welcome and show them where to find things that they require. We may not always listen to our parents but we are very good at imitating them. So please be a good role model for us. 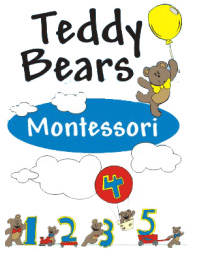 At Teddy Bears Montessori, your child learns through play, every day!